The American Flyer luggage set has been designed for the trendy, modern traveler who likes to be organized. You get 5 practical pieces, all of which can be used in a variety of situations, so whether you are going on a day trip, or even a couple of weeks away, your American Flyer luggage set will be ready to go when you are. The multitude of interior and exterior pockets ensure that your suitcase is organized, with all of your travel essentials within easy reach at all times, making your travel less stressful. The fabric is made from a 600D polyester material, which although not the strongest, it will provide good enough protection to the contents you place inside.  Unlike the Traveler’s Choice Amsterdam 8-Piece Luggage Set, where you get 8 pieces with probably four that you will never use, the American Flyer luggage set gives you 5 pieces that you can use in any situation. 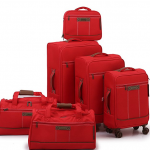 The American Flyer Astor Luggage set is a spacious and accommodating luggage set. The personal tote bag comes with two large exterior pockets, giving you enough space to pack all your travel documents and essential travel items within easy reach. The bag opens up from the top, giving you quick access to the main compartment, allowing for easy packing and unpacking. The same is said for the wheeled duffel bag, however, it is larger and has more of a spacious main compartment. 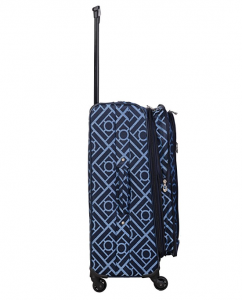 The three upright suitcases come with two exterior pockets, both of which are fairly large. It does allow easier access to the contents of the exterior pockets as opposed to the Fochier 6 Piece Luggage Spinner Set, which only has one large pocket. The inside of the upright suitcases consists of a large, spacious main compartment, where you will be able to store many clothes, along with a tie down strap to keep all the items in place throughout your journey. On the inside of the lid, you will find a zip-lined mesh pocket, where you will be able to place any loose items, in order to keep your luggage organized at all times. All the upright suitcases come with the ability to expand a further couple of inches, so if you are running out of space and trying to squeeze that last piece of clothing in, just unzip the expander and continue to pack. Each of the American Flyer upright suitcases comes with a telescopic handle, which can be locked in three places, ensuring that your suitcase is at the right height for you. Along with 360-degree spinner wheels, traveling has never been easier. You will now fly through the airport terminal with very little to no effort. 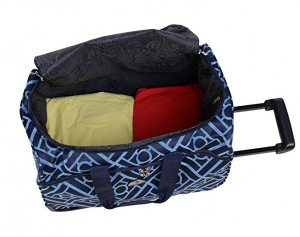 The wheeled duffel bag does need some effort to use, however, you are able to pack a bit more weight inside, as it has both wheels and a telescopic handle to aid you when using it. The three upright suitcases have the ability to expand a further couple of inches, allowing you to pack those extra items without placing unnecessary stress on your zippers. The personal tote bag has a carry handle, along with a detachable shoulder strap, so it is easier to use and bring on board. The personal tote bag weighs in at 1.85 lbs, which is light considering the amount of storage space that is inside. The wheeled duffel bag weighs in at 3.9 lbs, light enough to use as carry-on luggage without having to worry about the weight restrictions imposed by your airline carrier. The carry-on upright suitcase weighs in at 6.35 lbs, which is considerably lighter than the Rockland Luggage Varsity Polo Equipment 4 Piece Luggage Set carry-on suitcase. The medium upright suitcase weighs in at 7.4 lbs, and the large at 9.4 lbs. You will be sure to have enough left in your weight allowance to bring the items you want with you, while not having to worry about the restrictions imposed and a possible charge for excess weight. The American Flyer luggage bags have been constructed from a 600D polyester fabric, although not as strong and durable as higher density fabric as seen in the Rockland Luggage Skate Wheels 4 Piece Luggage Set, it should still stand up to any knocks, blows, and impact that comes with use. Previous customers do comment on the handle being rather flimsy and easy to tear off. This may be an issue if you overpack the suitcase or place heavy items inside. Although, if taken care of, it should last you a long time. 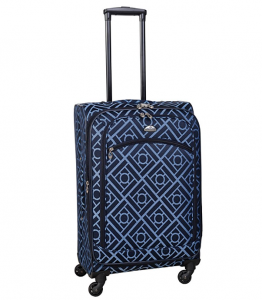 The American Flyer Astor 5-Piece Spinner Luggage Set is a stylish and fun looking set. It will appeal to anyone who feels that luggage is normally boring and uninteresting to look at. Available in three colors, each one is vibrant and attention-grabbing. 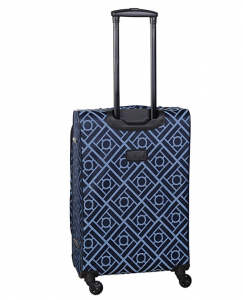 If you are artistic, you will enjoy the geometric pattern that the suitcase set showcases. It will definitely be easy to spot your luggage from the hordes of dull and lifeless bags on the baggage carousel. The personal tote bag measures at 17.5 x 12 x 12 inches, and is able to slide under the seat in front of you without any issues. The wheeled duffel bag measures at 18 x 12 x 12 inches, which will easily fit in the overhead lockers, with no risk of it being deemed too large. The upright carry-on suitcase measures at 22 x 14 x 9 inches, although on the edge of being too large as cabin luggage, if you do expand it, it will be sure to not fit in as cabin luggage. The medium carry-on suitcase measures in at 26 x 16 x 10 inches, and the large at 28 x 18 x 12 inches. American Flyer luggage are a good-sized suitcase set, and when not in use, they can be stored inside one another to save space in your attic or basement. The American Flyer Spinner Luggage sets come with a 2-year manufacturers warranty to protect your suitcase set from any manufacturing or material defects. As with most warranties, it does not cover any misuse, wear and tear, or mishandling. It is rather shorter than some of the luggage manufacturers’ warranties on the market today, with some even giving you a lifetime warranty. Out of many American Flyer Luggage reviews, the Astor set really does set itself apart from the competition. All five of the cases are functional in a variety of situations, and no longer will you have to worry about buying a new bag just for one trip. Although the warranty is rather short on this suitcase set, for the low-cost, you will be more than happy with two years of heavy use you will be able to get out of this set.